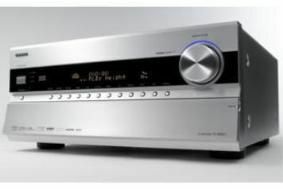 Onkyo launches two sub-£1000 AV receivers and the DV-BD507 Blu-ray player | What Hi-Fi? Cor blimey. And we're guessing the new DV-BD507 Blu-ray player, which Onkyo hopes will play the perfect partner, has plenty to say for itself, too. Weighing in at £800 and £700 respectively, the 'NR807 and 'SR707 both feature THX Select2 Plus certification, six HDMI inputs, 1080p upscaling and Audyssey DSX and Dolby Pro Logic IIz decoding. The TX-NR807 comes equipped with DLNA network streaming for audio, plus access to Internet radio, and firmware updates over your home network. Both receivers take Dolby True HD and DTS-HD, have eight channel Burr-Brown PCM1690 DACs and Texas Instruments' Aureus chips.The '707 offers a zone 2 capability, while the '807 ups that to a zone 2 and zone 3. You'll also find Onkyo's U.Port on both machines, compatible with the UP-A1 dock and the soon to be released UP-DT1 DAB+ digital radio module. On to the DV-BD507 player, and you'll find 1080p/24fps output for BD and 1080p upscaling for DVD, while there's decoding for all HD audio codecs and BD-Live support. A front-mounted SD card slot, DivX playback and AVCHD compatibility help to make for a thorough specification. The TX-SR707, £700, and the TX-NR807, £800, will be available in late July, as will the DV-BD507, price to be confirmed.